For the couple who hasn’t yet let it slip what gender their baby is, a gender reveal baby shower is a wonderful idea. It can be a lot of fun, and the theme can be used to create snacks, gifts, and party favors. Here are a few great gender reveal baby shower ideas. So that no one will guess the gender immediately, decorate for the baby shower in shades of green, yellow, or white. Alternatively, you can use both pink and blue decorations so the guests still can’t tell whether the baby will be a boy or girl until it’s time for the reveal. Fun décor items can include balloons with question marks drawn on them, to play up the theme. If you want to reveal your baby’s gender through a game, there are a few great ideas. Have several boxes wrapped in white paper with question marks drawn on them. During the gender reveal game, have ladies write a number on a piece of paper. Place them into a hat, and pick a number. When a specific lady’s number has been drawn, let her pick a box. She can unwrap it to find the gender of the baby. All of the boxes should be empty except for one, which contains a clue to the gender. A few ideas for the item include a blue or pink pacifier, a blue or pink baby outfit, or the ultrasound picture naming the baby as a boy or girl! Another really clever idea for a gender reveal baby shower is a cake that reveals the gender of the baby. This can be done by having the cake tinted pink or blue before it’s iced. Then, when the cake is cut, the guests will get a huge hint as to whether or not the baby is a boy or girl. Favor boxes or tins with colored candies are great baby shower favor ideas for this theme. 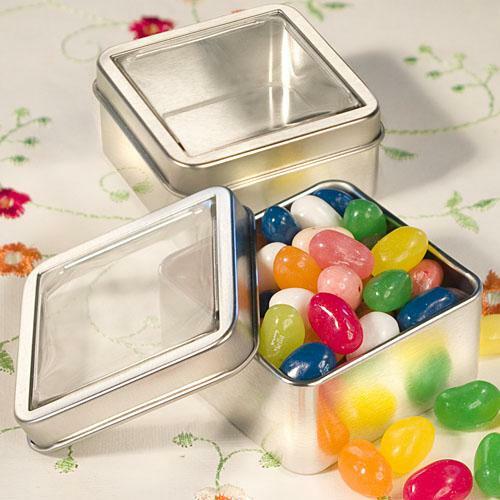 These beautiful Clear Top Mint Tin favors can be filled with pink or blue Jordan almonds, or other candies that fit the theme of your baby shower. 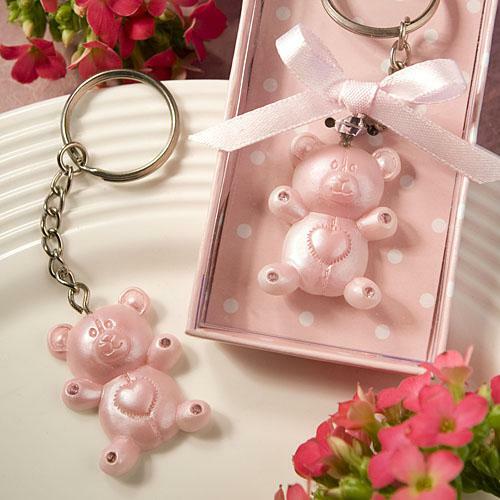 Alternatively, you could choose the Pink or Blue Teddy Bear Design Favor Key Chains and have them wrapped so no one gets a clue before the reveal! This entry was posted in Baby Announcements, Boy Theme Baby Favors and tagged Favors, games, gender reveal. Bookmark the permalink.